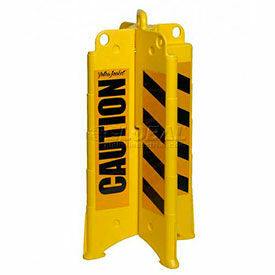 Safety Polyethylene Barricades Direct Traffic Flow And Cordon Off Hazards Or Construction. Safety Polyethylene Barricades are made with high density polyethylene and are forkliftable for ease-of-transport and long lasting durability. Dovetail joints interlock for secure attachment. Barrier sections can be filled with water or sand up to 400 lbs. Cable lugs included for joining prevent theft. High visibility reflective strips. Safety barricades lengths are 60", 71-1/4", 72" and 76-1/2". Heights are 24", 36" and 43". Available colors are Blue, Natural, Orange, Red, White or Yellow. Crowd Control Barricades Ward Away Pedestrians and Join Together to Create Extended Barrier Lengths. These all welded steel crowd control barriers are made for years of use. Safety barriers are easy to transport when assembled, and include removable feet that allow flat stacking for space efficient shipment and storage. Each barricade section includes couplers to join units in runs of any length. Barriers measure 102"L x 40"H overall with 5-1/4" spaces in between vertical bars. 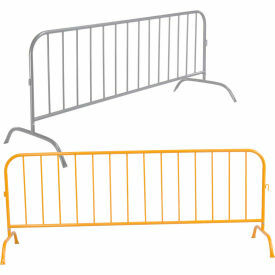 Security barriers are available with Galvanized or Safety Yellow Powder Coat Finish. Standard Barricades are constructed of 1-1/4" diameter tubular steel; Heavy Duty Barricades are constructed of 1-5/8" diameter tubular steel. Interlocking Plastic Barricades Have Interlocking Ends For Tool-Free Barrier Expansion And Allow Swing-Action For Flexible Configurations. These durable polypropylene plastic barricades are lightweight for easy handling and storage. Plastic safety barrier won't rust, chip or dent. One-piece interlocking unit has no weak points. 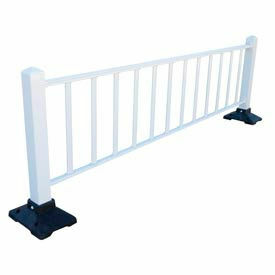 Safety barricades are designed for indoor and environmentally safe outdoor use. Molded, wide-angle feet provide stability. ADA Barricade measures 72"L.MOVIT®Standard Barricade measures 78"L. MINIT® Barricade measures 49-1/2 L. Plastic Extension for Minit® and Movit® barricades offers a cost effective extension to barricades. Use 2 extensions between 2 barricades. 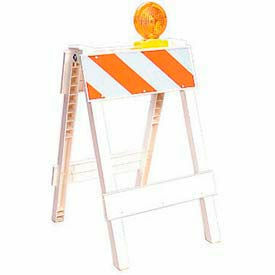 Measures 61 L x 10-2/5 H.
Traffic Safety Barricades Are Easy To Store And Set Up To Help Direct Traffic Or Limit Access Indoors Or Outdoors. 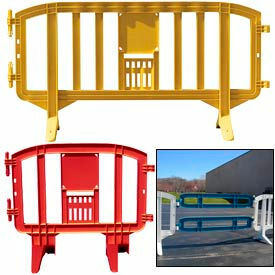 Traffic barricades include strong A-frame polyethylene legs that withstand repeated impact. A-frame legs accept mount flashing lights (lights sold separately). Beams include high visibility reflective engineer grade sheets on both sides. Easy to set up and take down, lay flat to store and to transport. Economy Barricades include 40 H x 28-3/5 W legs. Includes 6L x 8-1/8 W x 3/4 thick plastic Type III boards. Legs also accept plastic I-Beam boards that measure 7-1/2 W x 1-1/8" thick and wood boards that measure 7-1/2 W x 1-1/2 thick (not included). Premium Barricades include 42 H x 28 W legs. Includes heavy barrier boards that weigh 1 lb. The unique I-Beam design assures extra rigidity and protects the reflective sheeting. 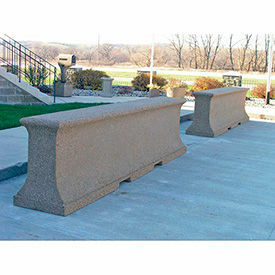 Barricade legs can be internally ballasted with sand for added stabilization. 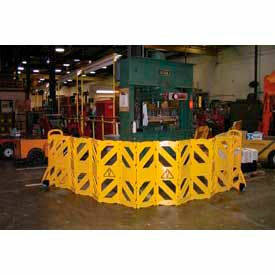 Safety barricades meet MUTC standards. Available with 1 or 2 panels. Extendable Safety Barriers Are Easy-To-Use For Any Indoor Barrier Application. Safety Barriers are made of plastic for long lasting durability. Used for indoor applications to limit access to work areas or off limit environments. Barriers are highly visible yellow. ANSI and OSHA compliant. Extendable Mobile Safety Barriers is made using articulating panels that allow straight, curved and circular configurations. Four locking straps keep barrier closed when not in use. Includes two 5 " diameter non-marring wheels to provide easy Tilt and roll portability. Top includes comfortable molded hand grips to provide user comfort and ease. Extends to 138" or 157" when opened. 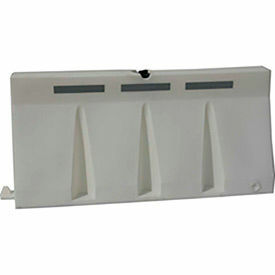 Folding Plastic Barricades choose a 2 or 3 panel barricade. High impact polyethylene is bright yellow with graphics molded in permanently. Extends 74" or 111". Minders, the ‘Little Yellow Man’ is a bright and friendly way to inform your customers of any cleaning or maintenance work. 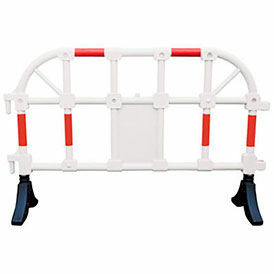 Can be linked with other Minders or AddGards Folding Plastic Barricade. Choose with or without stand. 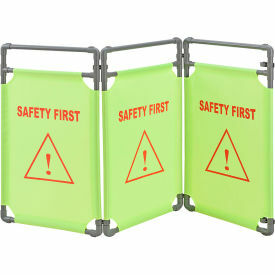 This unit features three 22-1/2" L x 38" H panels and extends to 69"L. With it's alert green/yellow fabric with "Safety First!" markings makes it highly visible. At only 7 lbs, this lightweight unit is portable, versatile and folds easily for storage. Each section is 1" thick - folded thickness is 3-1/2". Constructed with gray tubular plastic and fabric material that is water and mildew resistant polyester. Galvanized Steel Safety Barriers Create Durable Semi-Permanent Barrier Systems For Crowd & Traffic Control. Made using corrosion resistant galvanized steel with a powder coat finish. Barrier Rails include brackets and hardware for easy installation to Posts (sold separately). Rail height when mounted in 39-3/8 "H. Posts accept up to 2 barrier rails. Posts are held in place using a heavy duty black molded rubber base. Base allows floor anchoring with included hardware for increased stability and impact resistance. Post measures 4" x 4 ". 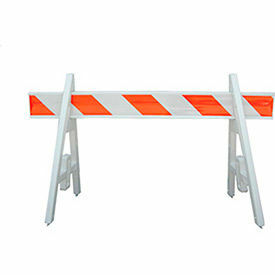 Base measures 11-3/4 "W x 15-3/4 "D.
Portable Barricades And Barriers Are Used For Applications Including Construction, Roadwork, Emergency Services, And More. Portable barricades and barriers are made of high quality materials for long lasting durability and corrosion resistance. Units provide visual safety barriers for outdoor work environments, crowd control, hazardous areas, and more. Barrier construction is rot, rust, crack, and peel resistant for added longevity. Portable feature allows ergonomic unit transport. Available styles include 2 Board Frame/Legs Only, Barricade with Sheeting, Beam with 2 Sided EGR Sheeting, Flashing UniLamp, Solar Barricade Lamps, Solar LED Barricade Light, and Type 2 Barricade. Colors are Amber, Orange/White, Red, White, and Yellow. Meets MUTCD specifications. Dimensions vary per model. Traffic Barricades And Sign Stands Are Used For Applications Including Construction, Roadwork, Emergency Services, And More. Traffic barricades and sign stands are made of high quality materials for long lasting durability and corrosion resistance. Stands deter traffic from hazardous roads and conditions including accidents, breakdowns, maintenance, and more. Compact design accommodates indoor and outdoor environments such as hallways, driveways, sidewalks, and more. Folding feature allows stacking, maximizing vertical storage while reducing footprint. Integrated brackets accept optional flashing lights (sold separately). Optional features include sandbag bar for added stability and reflective striped sheets for high visibility. Type is Barricade Sign Stand. Package quantities are 1 and 2. Colors are Orange, White, White/Lime, and Yellow. NCHRP 350 compliant. Dimensions vary per model. Folding Plastic Barricades Feature A Unique Design That Makes Set-Up And Retrieval Easier, Requiring Less Time And Personnel. Safety barriers open with little effort and fold to only 4-1/2" thick for stacking. Barricades are made with flexible high density polyethylene. Reflective sheeting for high visibility. Wide ergonomic handle allows easy lifting and transport. Mounting holes on top accept installation of optional accessories including lecterns, signs, tape and more. Barriers accept standard beacons already in use. 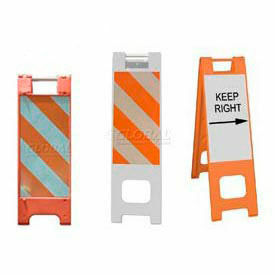 Safety Orange Plastic Barricade with reflective bands includes 4 W engineer grade sheeting. Yellow with Caution Barricade can be ballasted with sand for extra strength (sand not included). Police Barricade is high visibility blue with white reflective sheeting. Fire Barricade is high visibility red with white reflective sheeting. Pedestrian Crossing is lime with reflective sheeting. Fully assembled. These plastic safety barricades are MUTCD compliant and meet NCHRP-350 requirements with an attached light (not included). Plastic Handrail Barriers Are Interlocking End-to-End With Weighted Base For Greater Stability. Plastic Handrail Barriers are made with solid HDPE material with a UV stabilizer for long lasting durability. Barrier ends include connectors for interlocking units. 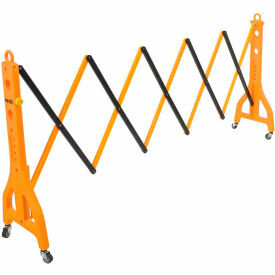 Base feet can be rotated 90° to allow for barrier stacking to provide easy storage. Barrier can be filled with sand or water to add weight. Base feet are non removable. Plastic Handrail Barriers are available in Orange or White w/Red Tape. Barriers measure 64"L x 40" H.
Petersen Mfg Concrete Barricades Manage Pedestrian and Vehicle Traffic for Safety and Efficiency. These concrete barriers serve to direct and manage traffic for construction sites, parking lots, public areas, and more. Pockets are provided for safe and proper handling. Available widths are 34" and 36". Barriers measure 24"L x 96"H. Sand color. Please note that power equipment is required for receiving and handling. 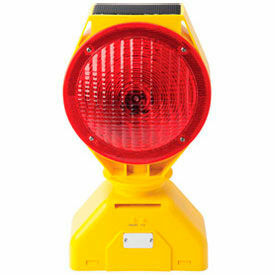 Barricade Lights Provide Safety and Security for Traffic Situations and Crowd Control Measures. Barricade Lights are made of high impact, weatherized polycarbonate material to provide long lasting durability. Models include Flashing UniLamp, Solar Barricade Lamp, Solar LED Barricade Lamp. Rechargeable battery included and built in circuit board on some models. Flash rate is 60 times per minute. Lights swivel 90° on base. Heights are 12" and 14". Available colors are Yellow, Amber and Red. Mounting bracket included.